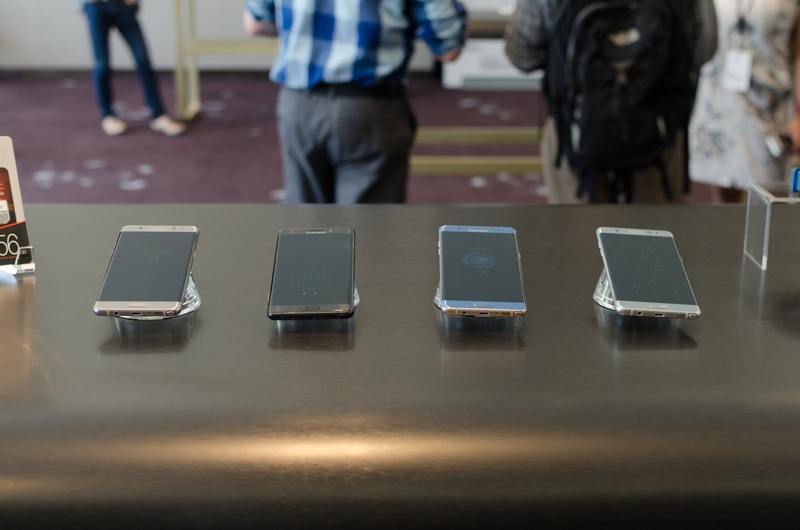 The Galaxy Note line is a staple at this point, a segment that Samsung truly owns as the first mover and has been wildly successful in ways that Samsung really didn’t predict. The Galaxy Note line has often been said to be the true flagship of the Galaxy smartphone family, and to some extent that probably isn’t far off the mark. 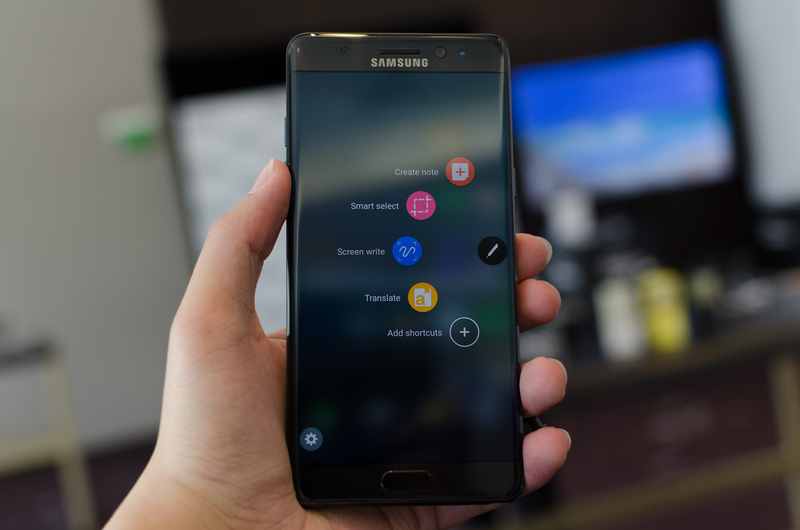 With the Galaxy Note7, Samsung is seeking to better indicate that status by bringing it up to the same generation as the Galaxy S7. 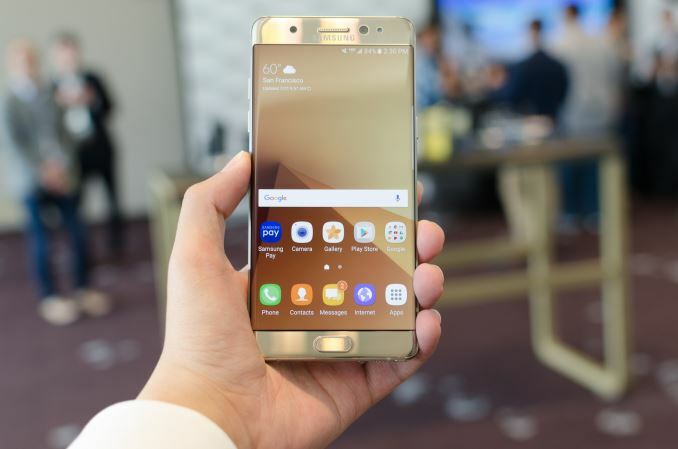 Of course, the number is just part of a name, so to see whether the Galaxy Note7 lives up to its promise as the flagship of the Galaxy line we can start with some basic specs. Camera 16MP Rear Facing w/ OIS f/1.9, 1.12µm, 1/2.6"
(Sony IMX240, Samsung S5K2P2) 12MP Rear Facing w/ OIS, f/1.7, 1.4µm, 1/2.6"
At a high level, there’s really not a lot that changes relative to the Galaxy S7 family. The same Exynos 8890 and Snapdragon 820 SoCs are used in the same regions as the Galaxy S7. The cameras are the same as well. Really, it’s easier to talk about what sets the Galaxy Note7 apart than the similarities as there is a lot of common ground here. Relative to the Galaxy S7 edge, the Note7 gains the S-Pen, a slightly larger 5.7 inch dual-edge display, and has a slightly smaller 13.48 WHr battery. 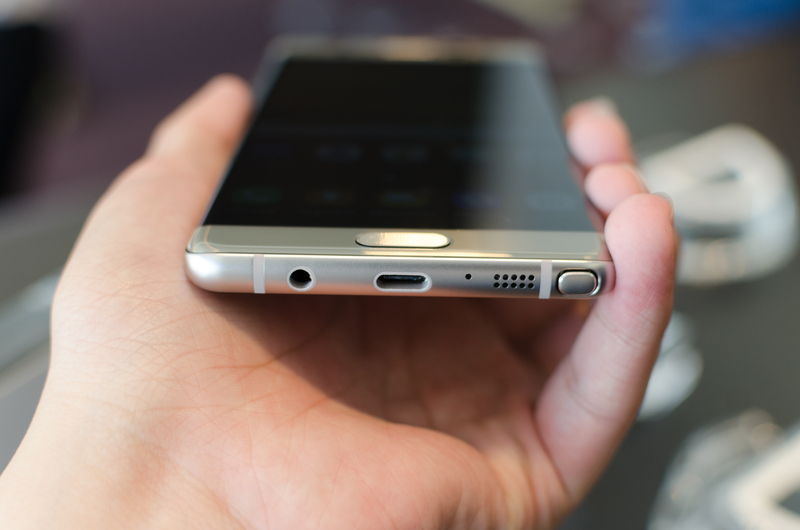 The Note7 also gains a USB type C port. 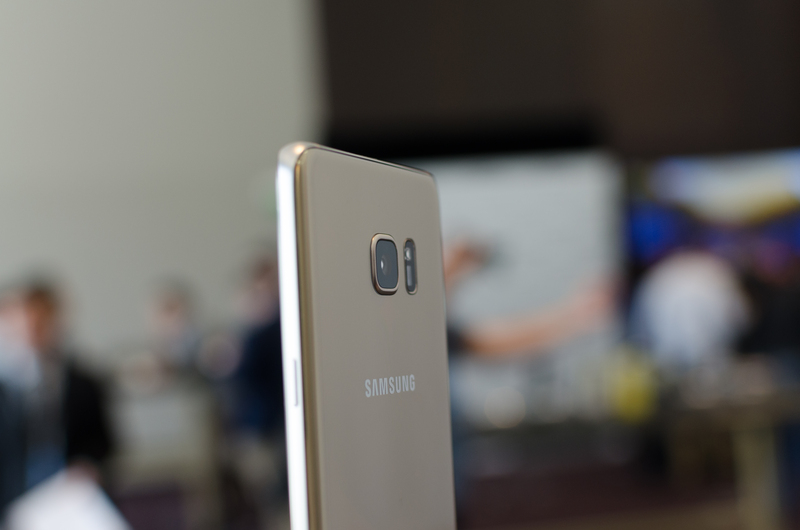 While it may be easy to get caught up on the slightly reduced battery capacity of the Note7 relative to the S7 edge, realistically the delta is solely due to the addition of the S-Pen. 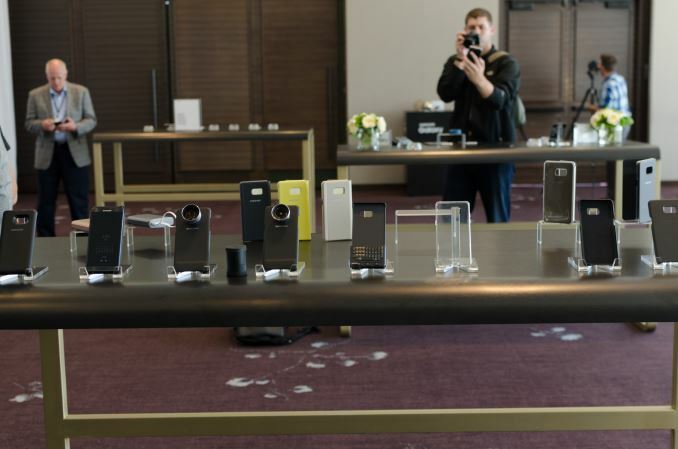 The camera hump is basically already nonexistent on these phones, so I’m not sure it necessarily makes a lot of sense to make the battery even larger when the cost will likely come in the form of a larger phone overall. Based on Samsung’s consumer research, one of the single biggest requests from users was to fit the biggest possible display into the smallest possible phone, so jumping up to something like 15 WHr would likely compromise that goal. In a lot of ways, the Galaxy Note7 attempts to try and refine the Galaxy S7 edge, and one of the notable ways that Samsung has done this is refining the design. 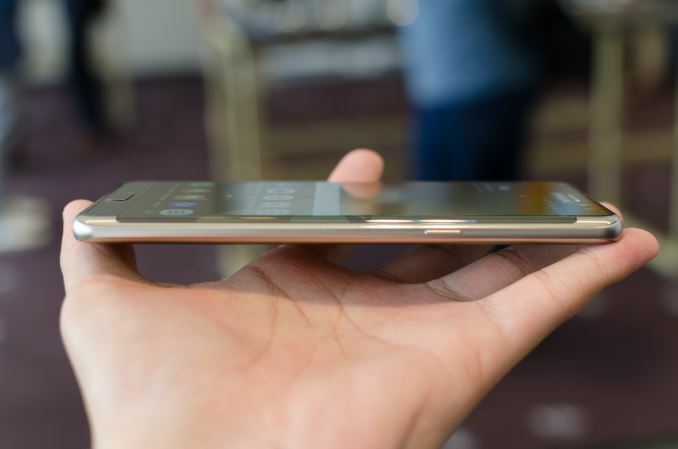 Samsung emphasized the amount of symmetry present in this design, and almost everything is aligned in this phone unlike the Galaxy S7. The Galaxy S7 felt like it wasn’t all that cohesive in general with things like the USB port misaligned with the speaker port and 3.5mm headphone jack, so this is actually a notable difference although I’m not sure this would really make a sale one way or another. 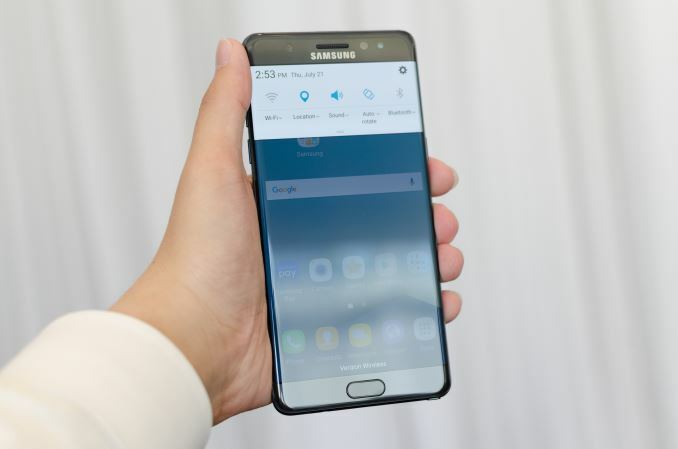 The more obvious way that design has been emphasized with the Galaxy Note7 is the total lack of a flat display variant, which was done in an effort to respond to the demand to make the device smaller. There’s really no doubt that the Galaxy Note7 is a smaller phone now as the width of the phone has been reduced by 3mm relative to the Galaxy Note5, and is almost identical in other dimensions and weight. That’s basically as far as the functional aspect of the edge display goes, and Samsung was fairly clear in their messaging that the edge display is just aesthetically better. They’re definitely not wrong here, but if you like using screen protectors the only way to cover the display will be with wet-application TPU-based protectors. Of course, Gorilla Glass 5 is on the front to help reduce the likelihood of damage but given that scratch resistance against ubiquitous quartz sand is still not going to be amazing you’ll still want a screen protector if microscratches bother you. By using the edge display and 3D curved glass on the back, the design of the Galaxy Note7 is notably symmetrical when you look at its side profile, which is actually a pretty neat effect. For whatever reason the display of the Galaxy Note7 doesn’t have the normal green tint at the edges that I’ve come to expect from the S7 edge. 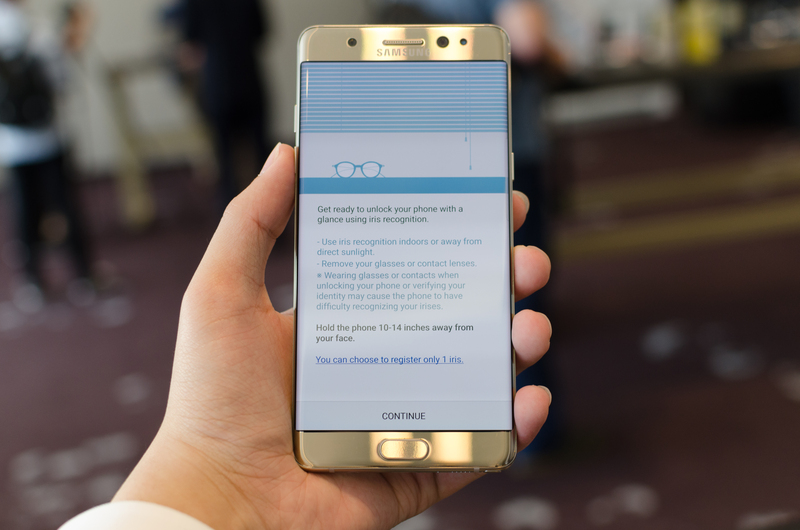 According to Samsung the curvature has been adjusted somewhat relative to the Galaxy S7 edge which is what results in the difference in viewing angles. The display is otherwise identical in terms of performance and efficiency, with the sole exception of a new HDR display mode that allows maximum brightness to go as high as 600 nits in high APL conditions for short periods of time. 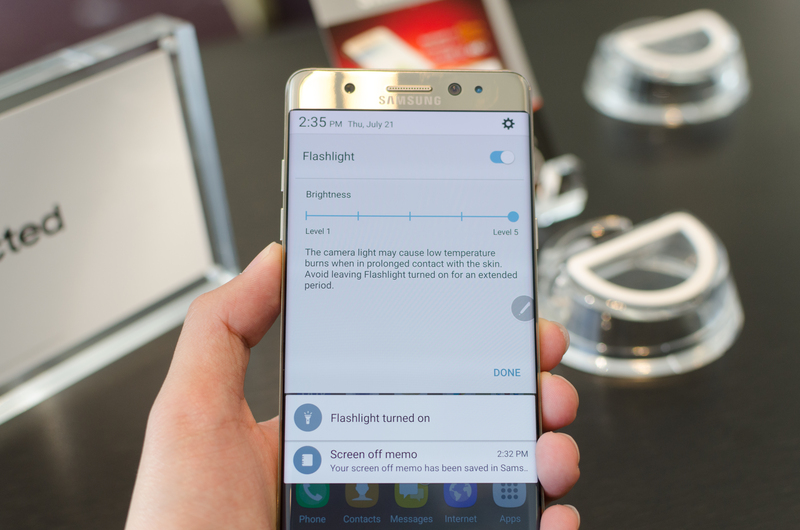 This is contrasted with the outdoor brightness boost function which is closer to 500 nits. Based on conversations with those at Samsung it seems that this mode can only be unlocked by a few specific applications like Amazon’s Prime Video app, but I’m sure that with enough digging around in the system it will be possible to figure out the API that allows for controlling this functionality for third party HDR video playback. Continuing with the design theme, the software of the Note7 has seen major revisions with a new version of TouchWiz that looks to incorporate better iconography and better overall design. Of course, it’s hard to say whether the device has been made smoother or faster here, but that’s something best left to the full review. There are also some notable new software features like a secure folder that uses Knox’s secure container APIs to allow photos, notes, and other app information to be stored separately with fingerprint or iris authentication. While we’re still on the subject, it’s worth mentioning that Samsung has added iris authentication on the Note7 which is probably not a surprise if you follow any of this closely. It seems to work well and uses IR light to make sure it works in low light but it’s important to note that this system has a somewhat low preview frame rate and can only use one set of eyes for registration. It also notes a number of limitations in the UI but doesn’t actually require you to take off your glasses or contacts even though it suggests these things in the UI. The iris scanner also works at about 10-14 inches away from the eye which is kind of surprising and leads me to believe that this may be closer to some advanced facial recognition with a wide and narrow angle lens to capture the face and eyes rather than true iris scanning. The other new software feature added is the ability to turn videos into GIFs with the S-Pen. Samsung representatives noted that this only works with non-DRM video, so I’m guessing that YouTube won’t necessarily work 100% of the time here although capturing videos taken by the camera definitely will. There’s also the ability to dynamically translate text selected by the S-Pen and take notes with the Always-On Display feature. Samsung has also wisely combined the mishmash of note-taking applications with the previous generations of Galaxy Note phablets and replaced them with a single Samsung Notes application to improve user experience. 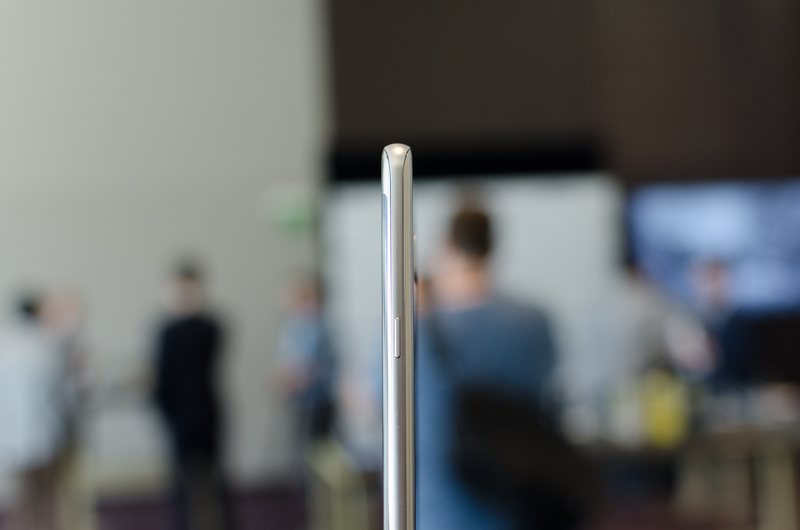 On the hardware side, the S-Pen has been redesigned so that the phone is not damaged if you decide the stick the S-Pen in backwards for whatever reason, and a smaller 0.7mm tip with double the pressure sensitivity of the Note5. The device is still fully IP68 compliant whether the S-Pen is attached or detached, so you can theoretically take notes with the phone in a bathtub or something similar. As the S-Pen uses licensed Wacom magnetic resonance technology, it maintains full accuracy and sensitivity in the presence of water unlike partially capacitive solutions like the Apple Pencil. Outside of the device itself, Samsung is including new accessories like an IP68 compliant wireless charging battery case, and an S View standing cover that makes it easy to prop up the device when it’s on a desk as Samsung noticed in their user studies that people often wanted to watch content without holding the device, with various implements used to achieve that goal. If you want the Galaxy S7 edge with an S-Pen, the Galaxy Note7 looks to be that and a bit more as far as software and overall design goes. It’ll be important to see how it does in the review but honestly given Samsung’s track record I would be surprised to discover anything out of the ordinary with the Note7. The Galaxy Note7 will be available in Blue Onyx, Silver Titanium, and Black Onyx in the US on AT&T, Sprint, T-Mobile USA, US Cellular, and Verizon in stores starting August 19 and preorders starting on August 3. An updated companion Gear VR with USB-C support and a slightly wider 101 degree FOV along with a dark blue design will also be available with the same dates for preorder and general release. Those Note 5 dimensions are wrong btw. The Note5 dimensions have been corrected. Seriously, being a mobile reviewer of Anandtech, you should know that this is not true. That 'SAMOLED+' nomenclature was used way back with GS2, not used for ages now. Look at J7, they are using S-Stripe/RGB-like sub pixel arrangement, there is SAMOLED 'PLUS' in that. Look at review of TabS2 in your own website. That's fair, but in this case I would explicitly use the plus notation or otherwise make a note of it in the spec table to indicate if it is an RGB stripe. Nonsense, I can see the Pentile effect on my Nexus 6P which is the same size and resolution.